You may have heard me say it before, but fall is my absolute favorite season. I honestly just soak up every every bit of it. Living here at Old Salt Farm makes me love it even more, which I didn’t even think possible! The changing leaves (which are spectacular here in NY), crisp weather, apple farms, cider mills, pumpkin patches, yummy fall recipes, Halloween, Thanksgiving, all things pumpkin, sweaters, boots, cozy fires…I adore it all. Decorating for fall is also so fun for me. I keep it very simple, which is my decorating style all the time. I mostly use natural decor like leaves, apples, and pumpkins to bring fall into my home, plus a few wood signs. 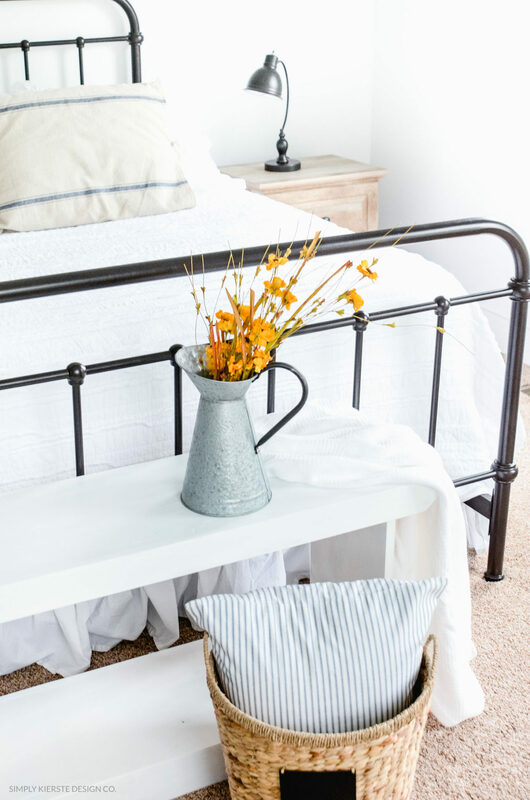 Not only is it my style to keep things simple, and I love the look of it, but it also means there is less to dust and clean! 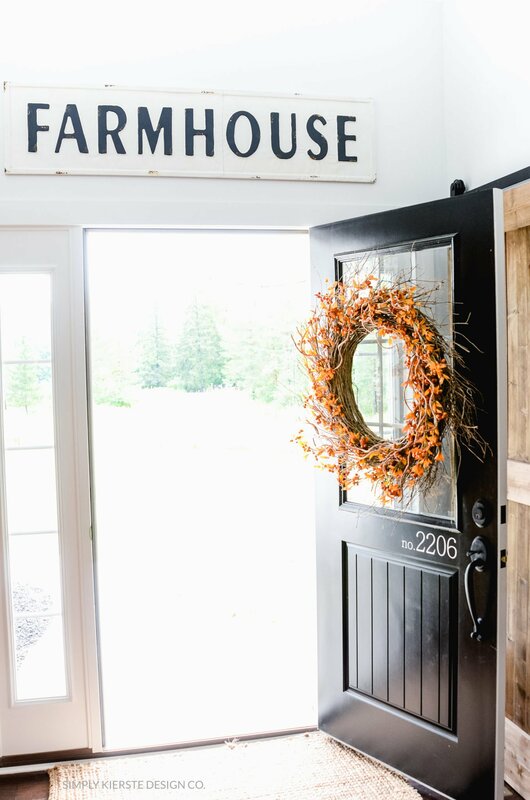 I am excited to show you my Fall Home Tour, and a peek into our fall farmhouse! I will admit I change things around a little bit through the season. I’ll switch out sunflowers for hydrangeas (or another flower), add pumpkins or a bowl of apples. I use what I have available, or what I find at farmers’ markets or apple farms. I love the subtle differences, and you’ll see them in the pictures! Affiliate links are included for your convenience. Find my full disclosure here. 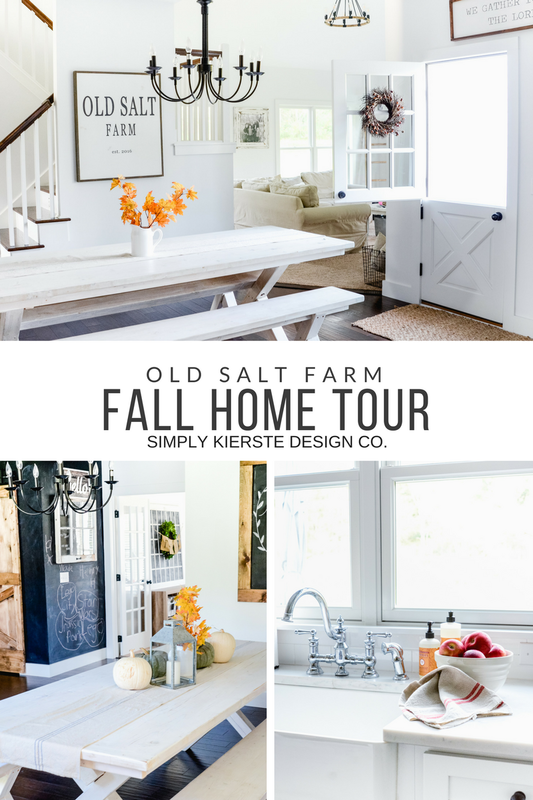 WELCOME TO OLD SALT FARM: FALL HOME TOUR! The dining room is one of my favorite spots, because it gets great light, and I can see so much of the house from there. We built the table years ago, and although we are planning to build a new one (square, to fit the space better), I really love it. I really wanted hand lettering on this chalkboard, but I’ve never done any before, especially not with chalk. I gave it a try, and I’m pleasantly surprised with the results! I didn’t remove the writing on the chalkboard wall by my Henry…he just loves Stars Wars and Legos so much, he had to let us all know! Here it is before I added the pumpkins, and with a bowl of apples. I’m kind of obsessed with apples in the fall–the apple farm is one of my favorite places to go, and I take a million pictures of them. Then I come home and place them in different parts of my house. Red is my favorite color, so that’s part of it I know, but they’re just so…fall! I am IN LOVE with my Dutch door. I had always wanted one, and I’m happy every day that it’s there! We do use it a lot, especially in the fall and spring, but I’m trying to figure out a half screen door so we can use it more in the summer. The kitchen island is another spot that rotates through different flowers and centerpieces. Recently I hung up hooks for my aprons, and I have two adorable fall aprons that look so cute there right now! In the laundry room I switched out flowers for some red/yellow leaves, and they add a simple touch of fall in the space. I love using black and white during the fall and Christmas…oh, let’s face it…all year long. Black gingham is my fave! I brought out a few metal pumpkins, and I love the warmth they add to the room. Galvanized metal can seem cold, but I actually find it to be the opposite. You can never go wrong with pillows in a wire basket–I switch a few of these out each season/holiday. I also change things around a little in the family room. I’ve had different things on the table in front of the couch too! I went with blue ticking and blue stripe grain sack pillows this year–neutral, but so farmhouse! They are two of my most favorite fabrics, and are so versatile. I also found these amazing sunflowers and white pumpkins at the apple farm, and ended up putting them on the table. I’m sure what you will appreciate most in this picture is my boys’ creation…Magna Tiles and Legos are the best! They bring their toys upstairs from the basement into the family room to play where I am, and then beg me in the morning to keep them there all day until they get home from school. The music room and office got a little touch of fall too! 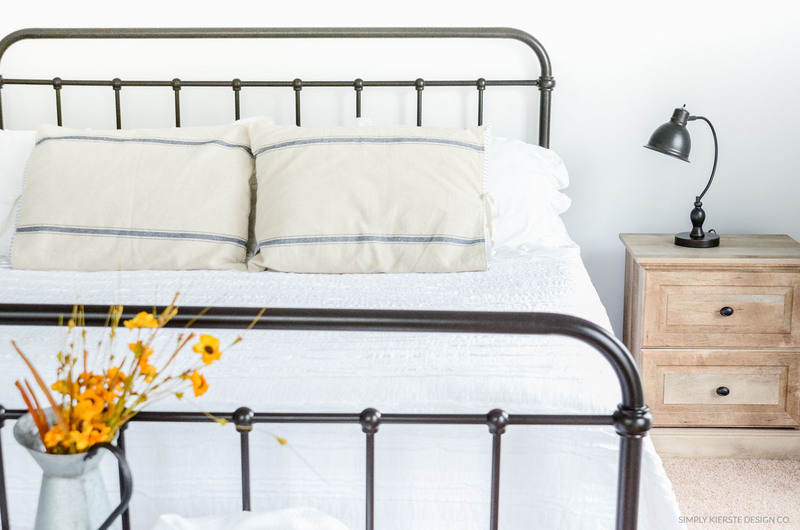 Grain stripe pillows and yellow flowers gave our bedroom a little fall charm, and I love it. That is gorgeous. Would love to make a trip to New York and see in person. Love, love, love Ole Salt Farm!!! It is beautiful – just like the Wade family!! So sorry to hear about your ankle/leg. :( Praying for a quick recovery for you. Beautiful home ,sweet Spirit cone across.Thank you for sharing. Love your house. Love the touches of color everywhere. I’m Dutch and grew up in a house with a Dutch door, very rarely seen in The Netherlands but our house was very old. Good luck with you ankle. I hope it heals soon. New follower via Fox Hollow Cottage. I feel your pain! After 3 visits to the doctor, 2 ER trips, 4 days in the hospital they did a 2nd xray and discovered I had a fracture in my leg …not just cellulitis.. This led to several weeks of down time. I am finally starting to put some weight on it. Take it easy and rest! Thanks so much, Tracy!! The color is Decorator White by Benjamin Moore–I love it!! I actually bought Simply White by BM first, but ended up changing my mind for the same reason–too yellowish. I’ve been so pleased with this white! Your house is gorgeous! I could never keep my house looking like that. My kids like to drag their things EVERYWHERE – we are working on it. :) This is officially my favorite blog!